Washington was infested with corruption and crony capitalism. So Trump closed his campaign with reforms that left the establishment praying he would lose the election. And now that Trump is President-elect, there are many questions surrounding his ability to fulfill his promises. But Americans received some good news on that front when Vice President-elect Mike Pence took over the transition effort and removed all lobbyists from the Trump team. The Trump team also put out a tough new lobbying ban for administration officials. “President-elect Donald Trump’s transition team on Wednesday announced that it will require incoming officials to terminate their lobbying registrations, and agree not to lobby again for five years after leaving the administration. Some media outlets worry this could make it difficult for Trump to staff his administration. Many White House officials use their proximity to power to begin lucrative careers in lobbying once their time in the administration is over. But Trump supporters argue you can’t “drain the swamp” with the same cast of characters. Discouraging the usual D.C. insiders from joining a Trump administration allows the President-elect to begin his term as free as possible from elite influence. Tellingly, this policy also applies to people joining the administration. Politico reports that Obama’s ban on lobbying, which was implemented at the start of his administration, did not apply to current lobbyists. Trump posted an infographic on Facebook laying out the other planks of his plan to cut down on the corruption in Washington. In addition to lobbying, Trump made other promising proposals, like cutting regulations. Cutting regulations would eliminate the favor trading between members of Congress and industry lobbyists. Insiders use regulations to reward favored industries, while punishing those who don’t have a seat at the table. A hiring freeze would also allow President-elect Trump to shrink government through attrition. As federal workers retire, they would not be replaced. That would decrease the government workforce, which has long been a conservative goal. Establishment insiders depend on government to generate wealth. But you can’t “drain the swamp” unless you crack down on the ability of the political class to manipulate the government to enrich themselves and reward their cronies. President-elect Trump’s ethics reforms are a good step in the right direction. It is a breath of fresh air in American politics. Work for the people instead of the politicians self serving agendas. Thank you, President Elect Trump. We The People now see through the liberal democrat snowflake anti-American protest and issues, the promotion of gay and race card, the bought out biased medias propaganda LIES, especially the previous administration LIES and the affirmative action token closet muslim as the lier in chief! Vicki, You are so right! President Trump is doing a good job, congress is holding him back. We definitely need term limits! That will clear out a bunch of Rino’s! A good start for the Republic. If you wear a charged Tin foil hat those particles will adhere to it and give even more shielding. The combination of that hat along with a spray bottle of vinegar should keep you happy all day long. You’ve been sniffing the kitty litter too much. That is where all that heavy metal Moronium is located. No, simply another weak minded fool taking money from Globalists while sucking up Lamestream media nonsense, I would like to know in what locations all this alleged bizarre weather is occurring, certainly not here in the upper Midwest. Well according to Al Gore the streets of Miami are flooded and fish are swimming along Biscayne Blvd. I’m in Florida and I haven’t heard anything like that from normal people. The FedGov has admitted it so are they telling the truth? Who would you believe if you were told attempts to control the weather are ongoing? Guess you never saw where the Air Force said they would “own the weather by 2025” which isn’t too far off. 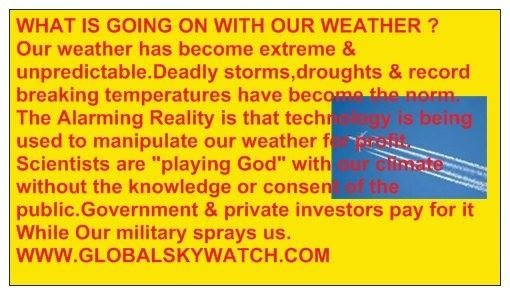 I am more concerned with the successful results of controlling weak minded deeply intranced Looney Libtards, through drugging, electromagnetic waves such as those emiiltted from the dish antennas at the 2 HAARP installations and of course subliminal messages, man can no more control the weather than changing it, try getting a grasp on reality. Speaking of getting a grasp on reality you should probably try it sometime. The reality is that man will attempt anything, whether he actually can do it or not is irrelevant because they will try anyhow. That seems to be your argument – they can’t be attempting weather control because it’s impossible and they don’t have the knowledge or means to do it. And like I said that’s never stopped them from trying before so you are wildly out of touch with what goes on in the world. 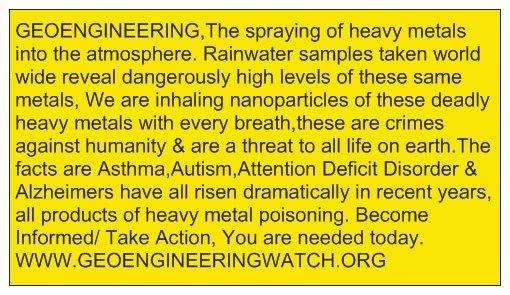 Also, if you’re so concerned with potential negative mental effects of electromagnetic waves emanating from the HAARP antenna complex you should be even more concerned with the RF frequencies emanating from the cellular towers spread around the country, especially in population intensive cities. Much more of a threat than HAARP heating the ionosphere by bouncing high energy RF waves off it. You are off on some bizarre plane of existence and have no grasp on reality, your are intranced by that nonsense the far left is pushing. I don’t come anywhere close to what the nonsense the loony left puts out. How you arrive at that is beyond me, must be pulling a page from the left and throwing out random claims based on nothing. Do me a favor, before making yourself look more clueless (you other posts seem to fit with my beliefs) actually look at the research and admissions of those involved. What I’m saying, that you are claiming is not reality, is well known among the people involved like the Air Force for one. This isn’t some secret conspiracy theory, they spell it out in US Air Force reports. We meddle with everything else on the planet including the people so why do you think trying to manipulate the weather is out of the question? Seriously, did you even take a glance at the links I provided? It is unfortunate but there are members of the right that drank the same koolaid the left has. They even see chemtrails on a moonless cloudy night. ▸ n. a trail of condensed water from an aircraft or rocket at high altitude, seen as a white streak against the sky. – ORIGIN 1940s: abbreviation of condensation trail. If so you are completely correct, bunch of idiots are what those people are who believe man having any affect on the weather. Some more for the clueless. Actually the use of so many drugs that has gotten you to the point of being scared of your own shadow is at fault. Along with your public school indoctrination. That applies to David as well. If you’re referring to me with that comment please explain your reasoning or do you just randomly bash people you don’t know for fun? Document the “use of so many drugs” and my “public school indoctrination”. You can’t because you don’t know me or anything about me so keep your false claims out of the discussion as it has no merit whatsoever. If you wish to speak of facts and technical issues then I’m fine with that, it’s the baseless Ad hominem attacks against someone you know nothing about that makes you look rather foolish. I suspect your better than that. I would have like to have flagged and block Mr. High on Whatever, but as it was I was only able to block him. I believe he is in cahoots with AKLibtard2015. Or could be the same person which is fairly common. I dont agree with everything you say but, you say but it is in a reasonable format of facts. And there are other people who believe it!! Yeh well Barf does know how to spell ‘accelerant’. Hey man you should really cut down on the pot. Cutting the meth and heroin out completely is not a bad idea either. Blame Al Gore he is mad because he can’t control the weather so he can make millions more on Climate change that he already got rich, rich, rich, from so much wasted tax payer money on a hoax scam the american people. Trump has also been using the media’s lies of Russia to his benefit. He has been doing a lot that has never been reported. The media still has that “Russian bone” in their mouths and will not let go. Hillary started that crazy Russia thing in a debate, because that’s what she was doing and spread it through the fake news, she’s the one sucking around Putin and getting loads of money from him but OH NO WE DON’T INVESTIGAT HER????? I am not sure that came first or the accusation that Trump pissed on a bed that ole jug ears slept in. And after almost a year of a “Russia-Trump” collusion, the libs STILL cannot let go, even though NOTHING has been proved–the proverbial beating of a dead horse. Sure they are all terrified cause they know they are guilty, that is why they are pushing so hard to get Trump out of office. RIGHT ON, THEN ALL THEIR BACKGROUND GOODYS WILL COME OUT, THERE ISN’T ONE OF THEM THAT ISN’T SUCKING CORRUPT MONEY OUT OF THE TAXPAYER GOVERNMENT IN NUMERIOUS WAYS AND THEY WOULD LOSE THEIR MILLION DOLLAR PERKS. Professional politicians lie and break oaths right and left. They’ll sign that pledge, and like the one Trump and the GOP signed during the election campaign, they’ll break it before the ink dries. (Wasn’t Preibus behind the pressure put on Trump to sign it?) Addendum: Anyone caught breaking this oath will automatically lose his position in any government position he holds and will be barred from holding ANY political office thereafter. Is that not on par with treason?, in essence you are betraying the trust of your constituents, so I would definitely say it is treason. The time period for not being allowed to lobby should be at least 10 years, consider the amount of millionaires in the Senate and way too many in the House as well. The swamp will never be drained until the denizens in the swamp are fired wholesale. Go back to small, well defined and focussed Depts of Defense, Justice, Treasury, Interior and Public Health. Deconstruct or integrate everything currently “served” by Fed Gov into these few depts, responsive to the constitution and the Congressally balanced budget Fed by taxes ok’d and apportioned by direct voter approval. Cancel any ability of the Fed to print money or create/eliminate credit that is not directly linked to increase/decrease to total real wealth of our nation. THE SAD PART IS oBAMA EITHER SOLD OR GAVE AWAY OR TOOK IT HOME, MOST OF OUR GOLD THAT UNITED STATES HD/HAS UNTIL IT WAS ALMOST EMPTY ONE TIME, HAVEN’T HEARD ANYTHING SINCE THAT MAYBE IT’S STILL ALL GONE AND THERE ARE OBAMA’S CROOKS IN CHARGE OF THE FEDERAL RESERVE SO WHO KNOWS, MIGHT BE EMPTY AND MAYBE THAT’S WHY THEY ARE TYING TO GET RID OF THE DOLLAR, WOULDN’T DOUBT IT, NONE OF THEM CAN BE TRUSTED, WE’LL HAVE TO GET PRESIDENT TRUMP TO CHECK THAT OUT, RIGHT? Secret service needs to investigate Obama, Michele, and Hillary Clinton who sold some of the gold for her personal gain. Make her give it back to the tax payers or water board her in front of the American people she LIED to. Especially to the Mothers of the four dead Americans she left wouldn’t answer the 3 o’clock call when they needed it. Get busy Secret Service!! !